When starting from absolute basics, it is useful to give a visualization of what makes electronics tick to the reader. At the physical and most fundamental level, electricity is determined by the motion of electric charges. For what matters to us, it means freely moving electrons (negative charges). At the atomic level, positive charges -also known are protons- are indeed not easily moved and bound together by the nuclear strong force. Electrons on the other hands, have a tendency to freely dissociate with their atom. Some elements have a tendency to give up electrons and some other are more likely to gain some. In pure digital electronics and CMOS circuitry1, current is mostly ignored in favor of voltage, but current is actually easier to understand and visualize. To put it simply, the flow of electrons mentioned above is the current. The bigger the flow, the more the current. The unit of measure for current is the Ampere, represented with the symbol A. When talking about “Current” and not an actual measured value, the letter I is generally preferred2. You might ask yourself: if it represents a flow, shouldn’t it be measured similarly to say, the capacity of a highway to move X vehicles per hour? Why not measure current in terms of “electrons moving per hour”? The good news is it is exactly what amperes, or amps for short, represent! One ampere is defined as 1 Coulomb per second. The Coulomb itself, is the measure of the electric charge and 1C is equivalent to the electric charge of a staggering 1018 electrons. Although it is interesting to know the definition of the current and how these units came to be, we will never mention Coulombs outside of this chapter ever again. 1 “Complementary metal-oxide-semiconductor”. Don’t worry, we’ll get there! 2 Ampere was a French scientist and used “I” in his research papers, for “Intensité de courant” (current intensity). Voltage is a different concept which you will often be seen described as “potential difference”. If you can visualize current as a measure of the number of charges crossing an imaginary line per seconds; you can see voltage as how much work would be done to move these charges from one point to another. The unit of measure for voltage is the Volt, represented with the symbol V. When talking about “Voltage” and not an actual measured value, the letter U is generally preferred1. 1 Volt is defined as 1 Joule per Coulomb. The joule2 being the unit of energy; you can also see voltage as the potential work that would need to be done to move a batch of charges across two points. To put it another way: if current is the measure of the flow of electric charge, voltage is what makes the charges want to start moving in the first place. An interesting byproduct of this definition is that measuring a voltage on a single point doesn’t have any meaning. For instance it is somewhat technically wrong to say you have a 9V battery. Of course, it is implied that this 9V is between the positive and the negative pins of the battery, but saying 9V on its own is meaningless. This is overtly pedantic for the sake of definition. In practice we usually define the voltage as the potential difference between a given point and a reference point called the ground. 1 The origins of the “U” seems to come from the German word “Unterschied” (difference). 2 You can ask yourself what is a “joule” and how it is defined as the unit of energy, but that would be beyond this lesson. Hint: search for “joule heating” or “joule’s first law”! Current and voltage in a vacuum don’t mean much. Electricity is transported through a physical medium, and for electronic engineers the medium is typically copper contained in wires or PCB traces; although other various metals are involved1. This medium has a conductance, that is to say, a degree to which it conducts electricity. The more the medium conducts, the easier current can flow through it. Electronics engineers never really refer to “conductance” though, but they use the inversely related measure of conductance called resistance. The unit of measure is the Ohm, with the symbol Ω (Greek letter Omega). Because Ω isn’t practical for keyboards, you can often see the resistance abbreviated as R. Conducting electricity is therefore a balance between finding a material that isn’t too expensive while maintaining a low resistivity. Conductance depends on the material and the temperature; and for metals conductance increases almost linearly with the temperature. 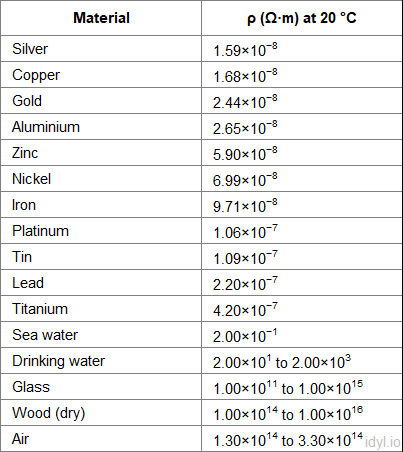 The table above shows the resistivity of various material in Ω.m. For instance, if you were to measure the resistance of sea water across a meter, you would measure 0.2Ω. In comparison; copper’s resistance is so close to 0 it is considered to be 0 in circuit design (unless transmitting a lot of power! Then the size of the wire/trace matters a lot! More on this later!). Copper oxidizes and connectors are often plated with another material as a result; with tin being a typical choice. Gold plated contacts are also common and often fetch a premium in electronics equipment3. 1Tin, silver and lead in solder; gold and nickel plating used in “ENIG” PCB manufacturing. 2That is to say, Resistance = 1 / Conductance. 3The better conductivity as compared to tin is not what matters here. Gold is far more stable and almost never corrodes; making it ideal for connectors. Electronic engineers often use multiples of the main unit to design systems. It is a good idea to get a picture of the most commonly seen. Resistances are often used in “kilos” (kΩ, thousands of Ohms), typical IC current draw is in the millis (mA, one thousandth of an Ampere) or micro-amps (μA, one millionth of an amp!) range; and only voltage is often referred to by its base unit. Typical embedded systems values include 1.8, 2.5 or the ever popular 3.3V logic. The greater the resistance, the lesser the current. A greater voltage will generate a greater current. If resistance gets close to 0, current gets alarmingly big: that’s a short circuit. 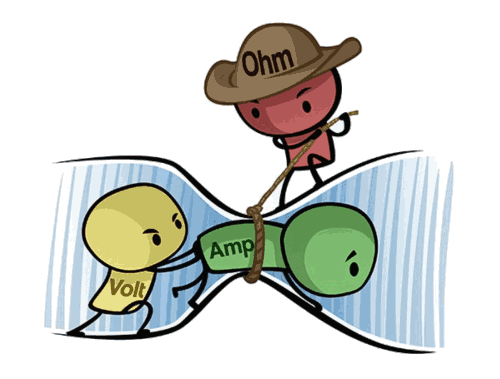 This humorous cartoon is quite an accurate depiction of Ohm’s law! A good analogy to electric current is a water dam. The higher the water level between the top of the dam and the other side, the more pressure there is against the wall. This is voltage. The diameter of the opening at the bottom of the dam controls how much water can flow to the other side. This is resistance. Amount of water flowing is the current. The analogy isn’t perfect. Electricity is different than fluid dynamics. For instance it flows at near speed of light whether there is is high pressure or low pressure. That being said, it is close enough and because of this voltage is sometimes referred to as “tension” as in “high tension cable” for high voltage lines. Power is simply defined as the product between voltage and current, and is expressed in Watts, symbol W.
A typical phone charger can be 10W for instance (5V 2A); whereas a blow dryer in 240V countries can easily reach 2000W. You only need a ridiculously tiny amount of current to kill a human being, as low as 100mA. People have survived lighting strikes; which are often described as being several million volts. Tasers are categorized as generally non lethal weapons and are marketed as being able to deliver several thousands volts. On the other hand, a typical domestic power outlet in 240V countries can deliver up 10A. With the same human body model of 1500Ω; that is 160mA of current and it can absolutely be lethal. In that sense, your 240V power outlet at home is deadlier than a 50000V stun gun! 1This one should be an absolute no brainer, as we have seen earlier in the definition of voltage; it is the potential difference between two points. The HV line might have 2000V between itself and Earth, but the bird experiences literally 0V sitting on the line itself. 2This behavior will be described in greater details in the chapter about power management. For now, keep in mind that power supplies have a limited amount of power they can provide. And with P=U.I, you can easily see that if P stays constant U must decrease if I increases.